The RIBs are designed for a top speed of 35+ knots carrying up to 13 passengers with an operating range of 200 nautical miles in up to four-meter wave heights. A Sept. 6, 2018 Press release announced the award of the contract to Metal Craft Marine. So, these will be the CBL for the OPC? 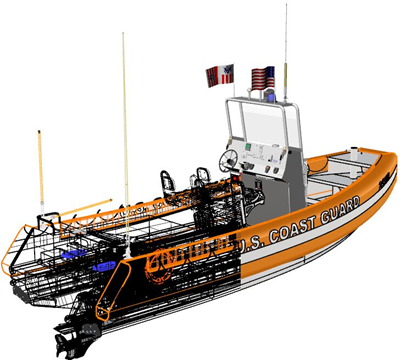 These are reportedly for “210-foot medium endurance cutters, 225-foot seagoing buoy tenders, and Coast Guard Cutters Alex Haley and Mackinaw.” The Over the Horizon IV is a little larger. 8 meter. We just let a contract with Safe Boats International for seven more OTH-IVs at an average cost of approx. $391K. This brings the total order to 103. It is used on the National Security Cutter, some WMECs (presumably 270s based on the info about the CB-L), and the Webber class FRC so I have presumed it would also go on the Offshore Patrol Cutter. The contract with Metal Craft is apparently the first order for this type and includes “two CB-Ls, trailers, delivery, training and associated logistics documentation was placed for approximately $590,000.” So the CB-L is cheaper. I presume the OTH-IV which has a “ballistic protection capability” may be better equipped for Navigation and Communications. Comments from those more familiarity with the boats would be welcomed.